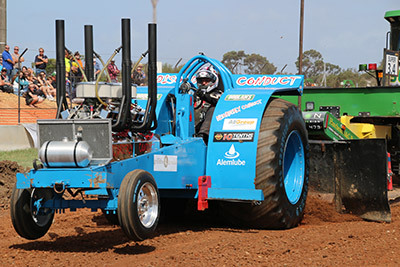 The first Australian Tractor Pull was first held in victoria in 1976. It has developed over the past years into a highly competitive and technical sport, where the difference between first and last place may be as small as one or two metres. Often the top tractors are separated by mere centimetres. The tractors are divided into classes and comply with either ‘Limited’ or ‘Open’ rules. The classes are Open Modified, Super Modified, Limited Modified, Open Mini Modified, Limited Mini Modified, Pro Stock (diesel) and Two Wheel Drive Trucks. The distinction between classes is determined by the overall maximum weight, engine modifications, fuels and physical size. Not satisfied with the power and noise generated by big engines like a Chevrolet 454 and 560 cubic inch motors, which may produce in excess of 1000 horse power, tractors pullers have devised methods of coupling two or even three of these engines together. Others have gone for a more exotic flavour and sourced their power from Chieftain tanks, WW2 Fighter Aircraft and even Jet Aircraft. Imagine, if you can, four Volkswagen Boxer engines lined up one behind the other, two screaming Mazda Rotary engines coupled together, a Jaguar V12, two Leyland P76 V8’s, Twin-Turbo V8 and even, at one stage, a Vampire Jet Engine. 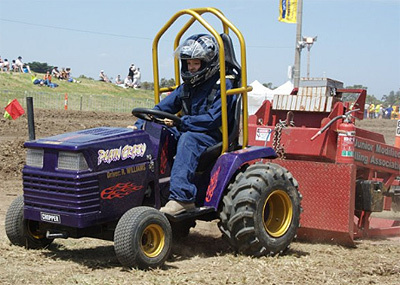 Tractor Pulling is a family orientated motor sport. There is a friendly atmosphere between all the members and their families. 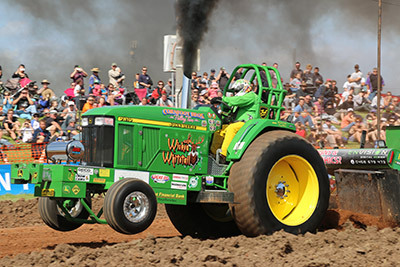 It is not uncommon for tractor pullers to cannibalise their own tractors (when they break) to allow another puller to compete. The sport is open to both women and men, the only restriction being that competitors must at least hold a current Learner Driver’s Permit. It sometimes comes down to members of the same family competing for the trophies. The tractors pull a machine that literally becomes heavier the further it is pulled down a 100 meter track. This machine is referred to as a ‘Weight Transfer Machine’. The weight transfer, or sled as it is commonly known, looks like a standard flat bed semi-trailer with a weight box instead of a standard load, this weight box weighs about 14 tonne. At the front of the sled, positioned where you would usually find the coupling point between the semi-trailer and prime mover, a steel skid pan is mounted. The total weight of the sled is approximately 22 tonne. The tractor is hitched to the sled by a chain. The weight box begins the pull located over the rear axles of the sled and as the tractor pulls the sled along the track a series of gears winch the weight box toward the front of the sled thus transferring the weight contained in the box onto the skid pan. 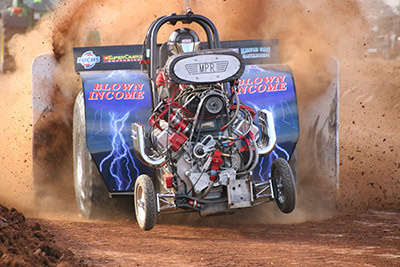 The Junior Modified Pulling Association (JMPA) was formed in 2006 by members of the Australian Tractor Pullers Association (ATPA) to establish an association that focuses on the younger members of our sport. The Junior Class is open to 8 to 16 year olds and features modified ride-on mowers. 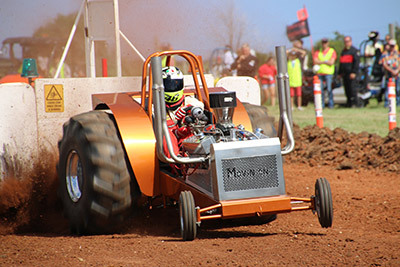 A special sled has been built to provide a great introduction to the sport of Tractor Pulling. The vehicles are based on standard ride-on mowers with the cutting deck removed. Additional safety features are mandatory and include a roll cage, seat belts and roll over bars. Modified Mowers are based on standard Ride-On Mowers with the cutting deck removed. Any single or twin cylinder 4 stroke vertical crank engine with a maximum of 16 H/P for a single cylinder or 500 cc for a twin. Tyre size to be a maximum of 24x12x10 inches or the equivalent in metric.